Miercom evaluated the Cisco Catalyst 2960-X and 2960-XR switches in accordance with the Certified Green Testing Methodology. The Gigabit Ethernet switches met the required energy-saving criteria to earn the Miercom Certified Green Award. 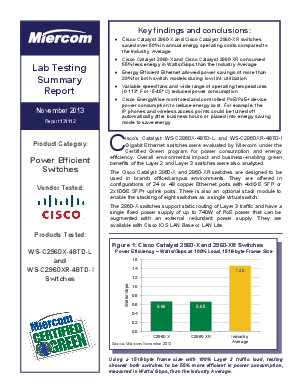 Based on hands-on testing and the verified representations made by Cisco, Miercom confirms that the Catalyst 2960-X and the 2960-XR are highly energy-efficient Layer 2 and Layer 3 switching solutions.